Artist's conception of the planet HD189733b. 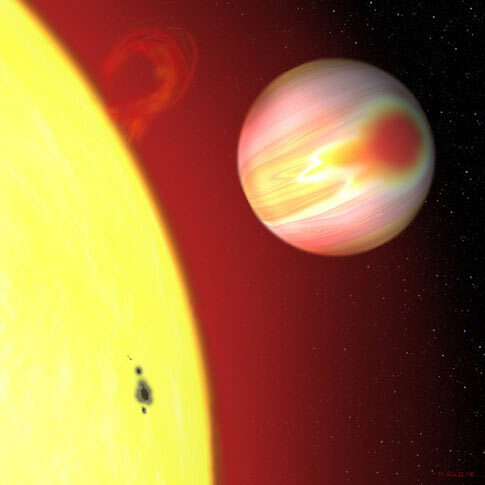 Wow, more cool extrasolar planet news. Using the Spitzer Space Telescope, astronomers have been able to make, for the very first time, a (very crude) map of the super-Jupiter orbiting the star HD 189733, about 60 light years away. The planet was discovered in 2005 (note this is not the new "Earthlike" planet found recently, this is a big gas giant like Jupiter) and is one of a handful that passes directly in front of its star as seen by us on Earth. In other words, it transits the star, making a little eclipse once per orbit. Transiting planets are very useful: by measuring how much the starlight drops, we can measure the size of the planet! The bigger the planet, the more the light from the star dims. This gives us a direct measurement of the planet's radius. But it also allows a cool technique to measure features on the planet, too. Imagine there is a really bright spot smack dab in the middle of the planet. As it orbits the star, the planet gets blocked by the star. We see the total system brightness drop (because the planet contributes a little bit of light). But when the bright spot gets blocked, the brightness would make a sudden dip. And if instead of a bright spot, we had a dark spot, when it got covered by the star, the brightness would not drop as quickly. So by very carefully measuring the way the brightness changes as the planet goes behind the star, we can actually make crude maps of planetary features, even though the planet itself is far too small to resolve into a disk. This technique has been used to make maps of Pluto and its moon Charon, in fact. Like I said, the map is crude (yet it represents 33 hours of observations and a quarter million data points! ), but it does show one obvious feature. Spitzer measures infrared light, so brighter objects in this case are warmer. That bright spot is a hot spot they found, which is roughly twice the size of Jupiter's Great Red Spot (which itself is several times bigger than Earth!). As it happens, the planet spins once for every time it goes around the star, so it always shows the same face to its star (the same way the Moon always shows the same face to Earth). So you might expect the hottest part of the planet to be right under the star, where the star is always directly overhead. 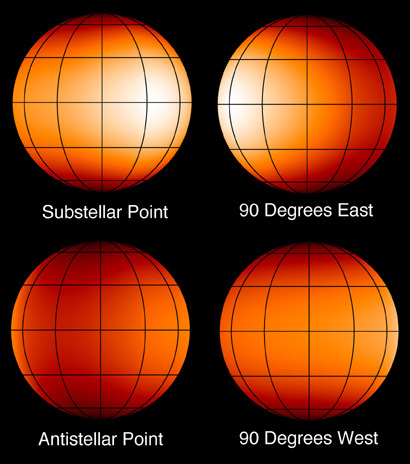 But that's not the case; the hot spot is actually about 30 degrees away from the "substellar point". Knutson speculates that this is due to winds on the planet; a sort of alien jet stream. That sounds plausible to me. At the moment this is the best map that can be made. But over time, as they make more observations, it is possible to improve on this map. Are there other warm spots? Are there cool spots? Can we learn more about the big spot? After all, all we know is its rough size and where it is, but not its shape. That might be possible to determine, though I can't imagine how difficult the observations would be! This is a fantastic step forward, and it makes me even more excited to think about what we might learn in the next few years. It takes advanced technology, but it also takes clever people to figure out how to use it to its best advantage. As it happens, we have both.